In the interest of clarity, predictability, rationality and simplification and in order to reduce the burden on manufacturers, and taking into account the current practice, it is necessary to further simplify and standardise the documents used for type-approval procedures. In the interest of rationality and simplification and in order to reduce the burden on manufacturers, certain information documents submitted and test reports drafted in accordance with Directive 97/68/EC should be accepted for the type-approval procedures under Regulation (EU) 2016/1628. The structure of the information document should be streamlined and simplified in order to avoid that the same information is repeated and to adapt it to the most common electronic format used by manufacturers and technical services. For the purposes of comprehensiveness and completeness, the information document and the single format of the test reports should include information on those engine categories or fuel types which are new in the legislation on type-approval of engines for non-road mobile machinery. In order to enhance the market surveillance activities, a new template for the statement of conformity should be established to clearly identify those engines placed on the market which are subject to certain exemptions or transitional provisions. For the purposes of clarity and easing access to relevant data, the template of the EU type-approval certificate should contain an addendum containing the most relevant information related with the type-approved engine type or engine family. The numbering system of the type-approval certificate should be revised in order to clearly identify each engine category and subcategory, as well as the fuel type, by a short alpha-numeric code in the interest of clarity and rationality. For the purposes of clarity and completeness, the format of the list of engines produced should be adapted to the new designation of engine types and engine families and provide for all the information required by Article 37(1) of Regulation (EU) 2016/1628. The data structure for the exchange of data by means of Internal Market Information System (IMI) should be limited to a basic outline in order to provide a certain level of freedom to the designers of the IT system and avoid the administrative burden of amending recurrently Annex VIII, as it would be necessary in the case of an excessively detailed structure. The technical requirements and procedures for the interconnection of IMI with existing national databases should be limited to a basic outline in order to provide a certain level of freedom to the designers of the IT system and avoid the administrative burden of amending recurrently this Regulation, as it would be necessary in the case of setting out excessively detailed interconnection requirements which would not fit with the particular needs of each Member State. For the purposes of clarity and simplification it is necessary to establish a harmonised system for the designation of engine types, engine families and engine types within the family. In order to address their possible misuse, it is necessary to provide for detailed provisions on prevention of tampering with the engines. ‘wall-flow particulate after-treatment system’ means a particulate after-treatment system in which all the exhaust gas is forced to flow through a wall which filters out the solid matter. 1. Manufacturers shall use the templates set out in Annex I to this Regulation when providing information folders and information documents in accordance with Article 21 of Regulation (EU) 2016/1628. 2. Existing information documents for engines of category RLL issued under Directive 97/68/EC or the information document of an equivalent type approval referred to in Annex XII to Directive 97/68/EC of the European Parliament and of the Council (2) may be submitted for the purposes of type-approval under Regulation (EU) No 2016/1628. 3. Existing information documents for Special Purpose Engines (SPE) issued under Directive 97/68/EC or the information document of an equivalent type approval referenced in Annex XII to Directive 97/68/EC may be submitted for the purposes of type-approval under Regulation (EU) 2016/1628. 4. Existing information documents for engines of category NRSh issued under Directive 97/68/EC or the information document of an equivalent type approval referred to in Annex XII to Directive 97/68/EC may be submitted for the purposes of type-approval under Regulation (EU) 2016/1628. Manufacturers shall use the templates set out in Annex II to this Regulation when delivering statements of conformity in accordance with Article 31 of Regulation (EU) 2016/1628. Manufacturers shall use the templates set out in Annex III to this Regulation when affixing markings to an engine in accordance with Article 32 of Regulation (EU) 2016/1628. Approval authorities shall use the template set out in Annex IV to this Regulation when issuing the EU type-approval certificates in accordance with Article 23 of Regulation (EU) 2016/1628. Approval authorities shall use the harmonised numbering system set out in Annex V to this Regulation when numbering EU type-approval certificates in accordance with Article 22 of Regulation (EU) 2016/1628. 1. Technical services shall use the single format set out in Annex VI to this Regulation when drawing up the test reports referred to in Article 6(3)(g) and Articles 22(6) and 23(3)(a)of Regulation (EU) 2016/1628. 2. Existing test reports for engines of category RLL issued under Directive 97/68/EC may be submitted for the purposes of type-approval under Regulation (EU) 2016/1628 under the condition that neither the substantive requirements nor the requirements regarding the test procedures have changed since the execution of the test. The difference between the per cent load and power and between the weighting factor for the mode number (mode no) of the test cycle given in section 3.7.1.4 of Annex III to Directive 97/68/EC and the corresponding mode number for test cycle F in Appendix 1 to Annex XVII of Commission Delegated Regulation (EU) 2017/654 (3) shall not be considered substantive for this purpose. 3. Existing test reports for engines meeting the Special Purpose engine (SPE) emission limit values issued under Directive 97/68/EC or the test report of an equivalent type approval referred to in Annex XII to Directive 97/68/EC may be submitted for the purposes of type-approval under Regulation (EU) 2016/1628 under the condition that neither the substantive requirements nor the requirements regarding the test procedures have changed since the execution of the test. 4. Existing test reports for engines meeting the NRSh emission limit values issued under Directive 97/68/EC may be submitted for the purposes of type-approval under Regulation (EU) 2016/1628 under the condition that neither the substantive requirements nor the requirements regarding the test procedures have changed since the execution of the test. Manufacturers shall use the format set out in Annex VII to this Regulation when submitting the list of engines in accordance with Article 37(1) of Regulation 2016/1628. Approval authorities shall use the templates and data structure set out in Annex VIII to this Regulation for the exchange of data by means of Internal Market Information System (IMI) in accordance with Article 22(5) of Regulation (EU) 2016/1628. 1. For the purposes of Article 44(3)(c) of Regulation (EU) 2016/1628, IMI shall offer a web-service for the transfer of data related to applications for EU type-approvals from existing national databases to IMI. 2. For the purposes of Article 44(3)(c) of Regulation (EU) 2016/1628, IMI shall offer a web-service for the transfer of data related to EU type-approvals that are granted, extended, withdrawn or refused from IMI to existing national databases. The first paragraph shall apply only where the Member State concerned has agreed to transfer of such data using web-service of IMI. For the purposes of paragraphs 1, 2 and 3 of Article 18 of Regulation (EU) 2016/1628, manufacturers shall use the parameters laid down in Annex IX to this Regulation when defining engine types and engine families, and their operation modes. For the purposes of Article 18(4) of Regulation (EU) 2016/1628, manufacturers shall apply the technical details laid down in Annex X to this Regulation for the prevention of tampering. (2) Directive 97/68/EC of the European Parliament and of the Council of 16 December 1997 on the approximation of the laws of the Member States relating to measures against the emission of gaseous and particulate pollutants from internal combustion engines to be installed in non-road mobile machinery (OJ L 59, 27.2.1998, p. 1). (3) Commission Delegated Regulation (EU) 2017/654 of 19 December 2016 supplementing Regulation (EU) 2016/1628 of the European Parliament and of the Council with regard to technical and general requirements relating to emission limits and type-approval for internal combustion engines for non-road mobile machinery (see page 1 of this Official Journal). Manufacturer's declaration and supporting data demonstrating that the emission control strategies fitted are designed in such a way as to prevent tampering to the extent possible, as referred to in Article 18(4) of Regulation (EU) 2016/1628 and in Annex X to this Regulation. In order to place engines from different engine families into the same tamper prevention engine family the manufacturer shall provide confirmation to the approval authority that the measures used to prevent tampering are similar. A description of the physical connector required to receive the torque signal from the engine ECU during the in-service monitoring test according to Appendix 6 to Commission Delegated Regulation (EU) 2017/655 (1) on monitoring of in-service engines, in order to procure such a connector. 2. Applications submitted on paper shall be in triplicate. Any drawings shall be to an appropriate scale and in sufficient detail on size A4 sheets or in a folder of A4 format. Photographs (if any) shall show sufficient detail. An (X) in the corresponding column of the table identifies the purpose(s) for which each item is required for: conduct of type approval test (Test), installation of the engine in the non-road mobile machinery (Installation) and control of homologation (Homologation). In the case of constant speed engines with multiple rated speeds an additional set column(s) of data for each speed shall be recorded in section 3.2 (Performance Parameters). In the case of category IWP intended to be used for both variable speed and constant-speed operation an additional column(s) of data for each operation shall be recorded in section 3.2 (Performance Parameters). 3.2. Each engine type or the parent engine in the matrix set out in point 2.1.3.1 shall be identified in accordance with the engine family designation and engine type designation set out in section 4. 3.5. When the same value for or description of a certain engine characteristic applies for several or all members of an engine family the corresponding cells may be merged. 3.7. Where a ‘type’ of a component is requested, the information supplied shall uniquely identify the component; this may be a list of characteristic, a manufacturers' name and part or drawing number, a drawing, or a combination of the aforementioned or other methods that achieves the same result. The manufacturer shall allocate to each engine type and engine family a unique alphanumeric code. 4.1. In the case of an engine type, the code is named engine type designation and shall clearly and unequivocally identify those engines presenting a unique combination of technical features for those items set out in Part C of Appendix 3 applicable to the engine type. The engine family designation shall clearly and unequivocally identify those engines presenting a unique combination of technical features for those items set out in Parts B and C of Appendix 3 applicable to the particular engine family. The FT shall clearly and unequivocally identify those engines presenting a unique combination of technical features for those items set out in Part C of Appendix 3 applicable to the engine type within the engine family. 4.2.1. The manufacturer may use the same engine family designation to identify the same engine family under two or more engine categories. 4.2.2. The manufacturer shall not use the same engine family designation to identify more than one engine family under the same engine category. 4.4.1. The use of brackets and hyphens is permitted provided they do not replace a letter or a numeral. 4.4.2.1. The reasons for using such variable characters shall be explained to the technical service and approval authority. (1) Commission Delegated Regulation (EU) 2017/655 of 19 December 2016 supplementing Regulation (EU) 2016/1628 of the European Parliament and of the Council with regard to monitoring of gaseous pollutant emissions from in-service internal combustion engines installed in non-road mobile machinery (see page 334 of this Official Journal). Hereby declares that the following engine type/engine family (*) complies in all respects with the requirements of Regulation (EU) 2016/1628 of the European Parliament and of the Council (1), Commission Delegated Regulation (EU) 2017/654 (2), Commission Delegated Regulation (EU) 2017/655 (3) and Commission Implementing Regulation (EU) 2017/656 (4) and does not use any defeat strategy. All emission control strategies comply, where applicable, with the requirements for Base Emission Control Strategy (BECS) and Auxiliary Emission Control Strategy (AECS) set-out in section 2 of Annex IV to Delegated Regulation (EU) 2017/654, and have been disclosed in accordance with that Annex and with Annex I to Implementing Regulation (EU) 2017/656. Strike out the unused options, or only show the used option(s). (1) Regulation (EU) 2016/1628 of the European Parliament and of the Council of 14 September 2016 on requirements relating to gaseous and particulate pollutant emission limits and type-approval for internal combustion engines for non-road mobile machinery, amending Regulations (EU) No 1024/2012 and (EU) No 167/2013, and amending and repealing Directive 97/68/EC (OJ L 252, 16.9.2016, p. 53). (2) Commission Delegated Regulation (EU) 2017/654 of 19 December 2016 supplementing Regulation (EU) 2016/1628 of the European Parliament and of the Council with regard to technical and general requirements relating to emission limits and type-approval for internal combustion engines for non-road mobile machinery (OJ L 102, 13.4.2017, p. 1). (3) Commission Delegated Regulation (EU) 2017/655 of 19 December 2016 supplementing Regulation (EU) 2016/1628 of the European Parliament and of the Council with regard to monitoring of gaseous pollutant emissions from in-service internal combustion engines installed in non-road mobile machinery (OJ L 102, 13.4.2017, p. 334). (4) Commission Implementing Regulation (EU) 2017/656 of 19 December 2016 laying down the administrative requirements relating to emission limits and type-approval of internal combustion engines for non-road mobile machinery in accordance with Regulation (EU) 2016/1628 of the European Parliament and of the Council (OJ L 102, 13.4.2017, p. 364). (5) Regulation (EU) No 910/2014 of the European Parliament and of the Council of 23 July 2014 on electronic identification and trust services for electronic transactions in the internal market and repealing Directive 1999/93/EC (OJ L 257, 28.8.2014, p. 73). This Appendix shall apply to electronically controlled engines, which use electronic control to determine both the quantity and timing of injecting fuel. a detailed description of algorithms or sensors (where applicable) used for identifying, analysing, or diagnosing incorrect operation of the particulate control system. The additional information required in point 2 shall be treated as strictly confidential. It shall be retained by the manufacturer and made available for inspection by the approval authority at the time of EU type-approval or upon request at any time during the validity of the EU type-approval. In this case, the approval authority shall treat this information as confidential and shall not disclose it to other parties. As alternative to entries 3.12.2.1.1 to 3.12.2.1.5. As defined in Annex II to Delegated Regulation (EU) 2017/654. Refer to section 2.4.13 in Annex IX (engine family definition). section 2 describing the restrictions applicable to the engine in accordance with the information set out in Table 1 of Appendix 2. 1.2. When delivered on paper format, the statement of conformity shall be no bigger than A4 paper format (210 × 297 mm). 1.3. All information on the statement of conformity shall be provided in ISO 8859 series (Information technology — 8-bit single-byte coded graphic character sets) characters (for statements of conformity issued in Bulgarian language in Cyril characters, for statements of conformity issued in Greek language in Greek characters) and Arabic numerals. In accordance with Article 31(5) of Regulation (EU) 2016/1628, the statement of conformity shall be made in such a way as to prevent any forgery and allowing verification of the secure electronic file. The paper used for the statement of conformity shall be protected by a watermark in the form of the registered mark of the manufacturer and by coloured graphics. 2.1.1. As an alternative to the requirements set out in point 2.1, the paper of the statement of conformity may be not protected by a watermark in the form of the registered mark of the manufacturer. In this case, the coloured graphics shall be supplemented with at least one additional security printing feature (e.g. ultraviolet fluorescent ink, inks with viewing angle-dependent colour, inks with temperature-dependent colour, micro printing, guilloche printing, iridescent printing, laser engraving, custom holograms, variable laser images, optical variable images, physically embossed or engraved manufacturer's logo, etc.). 2.1.2. Manufacturers may provide the statement of conformity with security printing features additional to those set out in points 2.1 and 2.1.1.
a number with the format ‘x of y’, where ‘x’ is the consecutive number of the sheet and ‘y’ is the total number of sheets of the statement of conformity. The electronic file shall be supplied in a format so that each modification after signing can be easily identified, and it can be incorporated into another document. In addition, it shall be signed by an ‘advanced electronic signature’ according to Regulation (EU) No 910/2014 of the European Parliament and of the Council (1), including the signature verification data. (1) Regulation (EU) No 910/2014 of the European Parliament and of the Council of 23 July 2014 on electronic identification and trust services for electronic transactions in the internal market and repealing Directive 1999/93/EC (OJ L 257, 28.8.2014, p. 73). conforms in all respects with the requirements of Regulation (EU) 2016/1628 with regard to an exemption or a transitional provision referred to in Article 31(1)(a) and (b) as indicated in Section 2 of this statement of conformity. If this model is used for EU type-approval of an engine as an exemption for new technologies or new concepts, pursuant to Article 35(4) of Regulation (EU) 2016/1628, the heading of the statement shall read ‘PROVISIONAL EU-STATEMENT OF CONFORMITY VALID ONLY ON THE TERRITORY OF … (3)’. Indicate the applicable option for the category and sub-category in accordance with entry 1.7 of the information document set out in Part A of Appendix 3 to Annex I. Indicate the applicable text from column 2 of Table 1 in Appendix 2. Indicate the applicable additional information from column 3 of Table 1 in Appendix 2. Indicate the applicable code from column 4 of Table 1 in Appendix 2, as shown on the supplementary marking to the statutory marking. Additional remarks by the manufacturer to clarify the restrictions on use applicable to the engine. Engine only for use by armed forces in accordance with Article 34(2) of Regulation (EU) 2016/1628. This engine shall only be placed on the market for installation in non-road mobile machinery that is exclusively to be used by the armed forces. Fire services, civil defence services, forces responsible for maintaining public order and emergency medical services shall not be considered to be part of the armed forces. Engine for field testing in accordance with Article 34(4) of Regulation (EU) 2016/1628. This engine shall only be placed on the market and entry into service as part of a field testing programme. By the date given the engine shall be either removed from use in the European Union or brought into conformity with the requirements set out in Regulation (EU) 2016/1628. SPE for use in potentially explosive atmospheres in accordance with Article 34(5) of Regulation (EU) 2016/1628. This engine shall only be placed on the market for installation in non-road mobile machinery to be used in potentially explosive atmospheres, as defined in point (5) of Article 2 of Directive 2014/34/EU of the European Parliament and the Council (1). SPE for launch and recovery of lifeboats operated by a national rescue service in accordance with Article 34(6) of Regulation (EU) 2016/1628. This engine shall only be placed on the market for installation in non-road mobile machinery exclusively used for the launch and recovery of beach launched lifeboats operated by a national rescue service. Replacement engine for category RLL or RLR placed on Union market on or before 31 December 2011 in accordance with the first paragraph of Article 34(7) of Regulation (EU) 2016/1628. This engine shall only be placed on the market to replace a locomotive or railcar engine that was placed on the market before 31 December 2011 where that replacement is authorised by the approval authority of a Member State due to the recognition that the installation of an engine in compliance with the applicable emission limits set out in Tables II-7 and II-8 of Annex II to Regulation (EU) 2016/1628 will involve significant technical difficulties. This engine shall comply with the emission limits that it would have needed to meet in order to be placed on the Union market on 31 December 2011, or shall comply with more stringent emission limits. Replacement engine for category RLL or RLR placed on Union market after 31 December 2011 in accordance with the second paragraph of Article 34(7) of Regulation (EU) 2016/1628. This engine shall only be placed on the market to replace a locomotive or railcar engine that was placed on the market after 31 December 2011 where that replacement is authorised by the approval authority of a Member State and the replacement engine complies with the emission limits that the engine to be replaced had to meet when originally placed on the Union market. RLL or RLR engine to be part of a project at an advanced stage of development as defined by Directive 2008/57/EC of the European Parliament and of the Council (2) on 6 October 2016 in accordance with Article 34(8) of Regulation (EU) 2016/1628. This engine shall only be placed on the market as part of a project at an advanced stage of development as defined by Directive 2008/57/EC of the European Parliament and of the Council where it has been authorised by the approval authority of a Member State due to the disproportionate cost of using engines complying with the emission limits set out in Tables II-7 or II-8 of Annex II to Regulation (EU) 2016/1628. Engine that incorporates new technologies or new concepts and that, as a result of those new technologies or new concepts, is incompatible with one or more requirements of Regulation (EU) 2016/1628. This engine shall only be placed on the market as an engine incorporating new technologies or new concepts where it holds a provisional type approval certificate granted by the approval authority of a Member State in accordance with Article 35(4) of Regulation (EU) 2016/1628. Engines of category RLL with a maximum net power greater than 2 000 kW to be installed in locomotives which only run on a technically isolated 1 520 mm railway network, in accordance with Article 58(9) of Regulation (EU) 2016/1628. This engine shall only be placed on the market for use on a technically isolated 1 520 mm railway network where it has been authorised by the approval authority of a Member State. This engine shall, as a minimum, comply with the emission limits that engines had to meet to be placed on the market on 31 December 2011. Replacement engine for category NRS with a reference power no less than 19 kW or belonging to a category equivalent to NRG where the replacement engine and the original engine belong to an engine category or power range that was not subject to type-approval at Union level on 31 December 2016 in accordance with Article 58(10) of regulation (EU) 2016/1628. This engine shall only be placed on the market to replace an engine of category NRS with a reference power no less than 19 kW or category NRG that has no type approval under Directive 97/68/EC. Replacement engine for category NRE with a reference power no less than 19 kW and no greater than 560 kW, or belonging to a category equivalent to NRE and with a reference power greater than 560 kW, where the replacement engine and the original engine belong to an engine category or power range that was not subject to type-approval at Union level on 31 December 2016 in accordance with Article 58(11) of Regulation (EU) 2016/1628. This engine (*1) shall, comply with an emission stage that expired not more than 20 years before the placing on the market of those engines and that is at least as stringent as the emission limits that the engine to be replaced had to meet when it was placed on the market originally. (*1) Only applicable to replacement engines of category NRE with a reference power no less than 19 kW and no greater than 560 kW. (1) Directive 2014/34/EU of the European Parliament and of the Council of 26 February 2014 on the harmonisation of the laws of the Member States relating to equipment and protective systems intended for use in potentially explosive atmospheres (OJ L 96, 29.3.2014, p. 309). (2) Directive 2008/57/EC of the European Parliament and of the Council of 17 June 2008 on the interoperability of the rail system within the Community (OJ L 191, 18.7.2008, p. 1). 1.1. 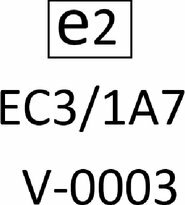 All text included in the statutory and temporary markings shall be provided in ISO 8859 series (Information technology — 8-bit single-byte coded graphic character sets) characters (for Bulgarian language in Cyril characters, for Greek language in Greek characters) and Arabic numerals. 1.2. The manufacturer shall affix to each engine the statutory marking set out in Section A before the engine leaves the production line. 1.2.1. Notwithstanding point 1.2, manufacturers shall amend the statutory marking of an engine after it left the production line when the mandatory essential information and, where applicable, the supplementary information required for that engine has changed before it is placed on the market. The information on the statutory marking shall contain at least the information set out in Table 1 of Appendix 1. The character ‘X’ indicates the mandatory essential information and, where applicable, the supplementary information required for the marking of engines as set out in Art 32 of Regulation (EU) 2016/1628. 2.1. The statutory marking shall be located so as to be readily visible after the engine has been completed with all the auxiliaries necessary for engine operation. 2.2. The location of the statutory marking shall be declared in the information document set out in Annex I. 2.3. Where required for the purpose of Article 8(6) of regulation (EU) 2016/1628 the OEM shall be provided with a duplicate of the statutory marking to be affixed to the engine or non-road mobile machinery in a readily visible and easily accessible position when the engine is installed in the non-road mobile machinery. 3.1. The statutory marking shall be affixed to an engine part necessary for normal engine operation and not normally requiring replacement during engine life. 3.2. It shall be affixed in such a manner that will remain durable for the emission durability period of the engine and shall be clearly legible and indelible. 3.3. If labels or plates are used, they must be affixed in such a manner that they cannot be removed without being destroyed or defaced. 1.1. For engines delivered separately from its exhaust after-treatment system the wording ‘Separate Shipment Art 34(3)*2016/1628’. the wording ‘Not-in-Conformity Art 33(2)*2016/1628’. The temporary marking shall remain affixed to the engine by a removable label or a robust separate tag (e.g. a laminated sheet attached with a wire-tie) until the engine is in conformity with the approved type. (1) Including engines exempted by Article 34(3) of Regulation (EU) 2016/1628. (2) Alternatively, for engine categories NRSh and NRS excluding sub-categories NRS-v-2b and NRS-v-3 and where engine and non-road mobile machinery are fully integrated and cannot be identified as separate components, indicate the non-road mobile machinery production date. (3) Alternatively, indicate the EC type-approval number of the equivalent EC type-approval set out in Annex XII to Directive 97/68/EC. the character ‘V’ representing the compliance with the provisions of Regulation (EU) 2016/1628 followed by a hyphen (‘-’) and the sequential number of the EU type-approval set out in point 2.4 of Annex V.
The undersigned hereby certifies the accuracy of the manufacturer's description in the attached information document of the engine type/engine family (1) described above, for which one or more representative samples, selected by the approval authority, have been submitted as prototypes and that the attached test results apply to the engine type/engine family (1). The engine type/engine family (1) meets/does not meet (1) the requirements laid down in Regulation (EU) 2016/1628. If this model is used for EU type-approval of an engine as an exemption for new technologies or new concepts, pursuant to Article 35(4) of Regulation (EU) 2016/1628, the heading of the certificate shall read ‘PROVISIONAL EU TYPE-APPROVAL CERTIFICATE VALID ONLY ON THE TERRITORY OF … (7)’. NRSC final result with DF. Indicate only the latest amendment in case of an amendment of one or more Articles of Regulation (EU) 2016/1628, according to the amendment applied for the EU type-approval. Delete this entry when not applicable. Indicate whether the approval is for a NRS (< 19 kW) engine family consisting exclusively of engine types for snow throwers. Applicable only for EU type-approval of an engine type or an engine family as an exemption for new technologies or new concepts, pursuant to Article 35 of Regulation (EU) 2016/1628. Indicate the test cycle in accordance with the fifth column of the Tables set out in Annex IV to Regulation (EU) 2016/1628. 1. EU type-approval certificates shall be numbered in accordance with the method set out in this Annex. 2. The EU type-approval number shall consist of a total of five sections as detailed below. In all cases, the sections shall be separated by an asterisk (‘*’). 2.2. Section 2: denotes the number Regulation (EU) 2016/1628 of the European Parliament and of the Council in the form 2016/1628. 2.5. Section 5: denotes the extension number of the EU type-approval and consists of a two-digit sequential number, with leading zero (as applicable) starting from ‘00’. 2.6. Where used on the engine's statutory marking only, section 2.5 shall be omitted. 2017/RRRSHB3/P= Regulation (EU) 2017/RRR to denote the latest amending Regulation and the characters ‘SHB3/P’ to indicate that is an engine of category and subcategory NRSh-v-1b, with EDP Category 3, operating on petrol, in accordance with the Codes set out in Tables 1 and 2 of Appendix 1 respectively (section 3). 2016/1628EC3/1A7= repeats Regulation (EU) 2016/1628 to denote that it has not been amended. The characters ‘EC3’ denote that is a NRE-c-3 engine. The characters ‘1A’ denote it is a dual fuel engine of type ‘1A’. The suffix 7 to denote that the gaseous fuel is of type ‘LN2’ (a specific liquefied natural gas / liquefied biomethane composition resulting in a λ-shift factor not differing by more than 3 per cent the λ-shift factor of the G20 gas specified in Annex I to Delegated Regulation (EU) 2017/654 and the ethane content of which does not exceed 1,5 per cent), in accordance with the Codes set out in Tables 1 to 3 of Appendix 1 respectively (section 3). 2017/RRRLV1S/D= Regulation (EU) 2017/RRR to denote the latest amending Regulation and the characters ‘LV1S/D’ to indicate that is a locomotive engine meeting the SPE emission limits type-approved to run on diesel, in accordance with the Codes set out in Tables 1 and 2 of Appendix 1 respectively (section 3). Engine approved and calibrated for any other (than above) liquefied natural gas / liquefied biomethane composition. (*1) Replace ‘#’ with approved gas specification from Table 3. One test report shall be completed for each tests required for EU type-approval. Each additional (e.g. a second speed on a constant speed engine) or supplementary test (e.g. another fuel is tested) will require an additional or supplementary test report. 2.5. Where a ‘type’ of a component is requested, the information supplied shall uniquely identify the component; this may be a list of characteristic, a manufacturers' name and part or drawing number, a drawing, or a combination of the aforementioned or other methods that achieves the same result. 2.6. The test report may be delivered on paper on in an electronic format agreed between the manufacturer, technical service and approval authority. 11.1 Cycle emissions results to be stated in Table 11. NRSC final result with DF (1). For NRSC note the cycle indicated in point 9.1; for NRTC note cycle indicated in point 10.1. Copy the results from Table 9.3.2. For an engine type or engine family that is tested on both the NRTC and NRSC, indicate the hot cycle CO2 emissions values from the NRTC noted in point 10.3 or the NRTC-LSI noted in point 10.4. For an engine only tested on an NRSC indicate the CO2 emissions values given in that cycle from point 9.3.3. (1) The dynamometer setting shall be determined using the procedure set out in point 7.7.1.3 of Annex VI to Delegated Regulation (EU) 2017/654. The auxiliary power in that point shall be determined using the total values set out in Tables 1 and 2 of this Appendix.